Valentine’s Day is just around the corner, I thought my new post should be a chocolate dessert. Now a days short cooking videos are very popular in social media and people tend to share a lot of those videos. Although I love to watch such videos, I am not at all comfortable making video recipes :) :) …. Today’s recipe is one such shared recipe on Facebook. I immediately loved the recipe as it has my favourite chocolate and coffee in it. 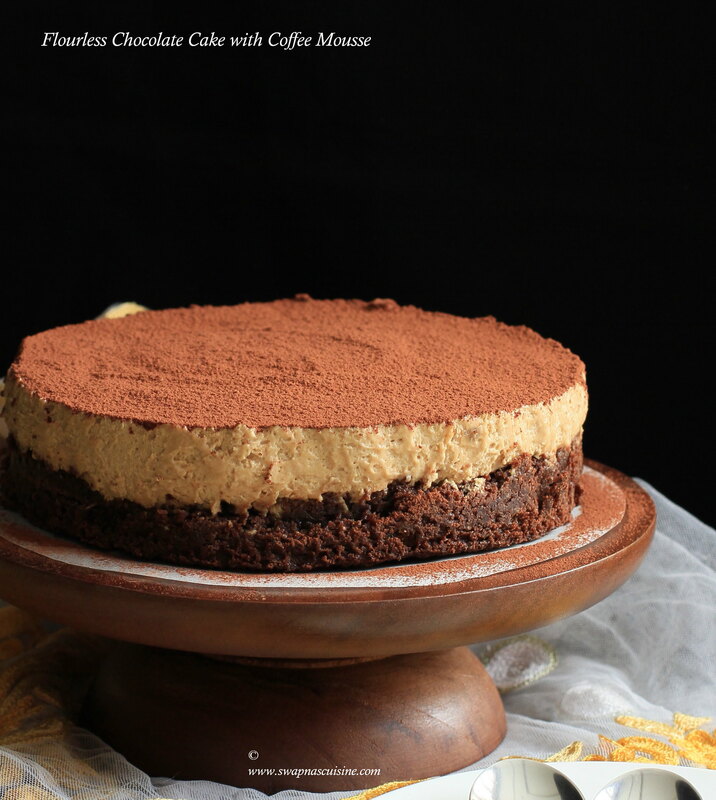 The chocolate cake is flourless and it is great for those who have gluten intolerance. 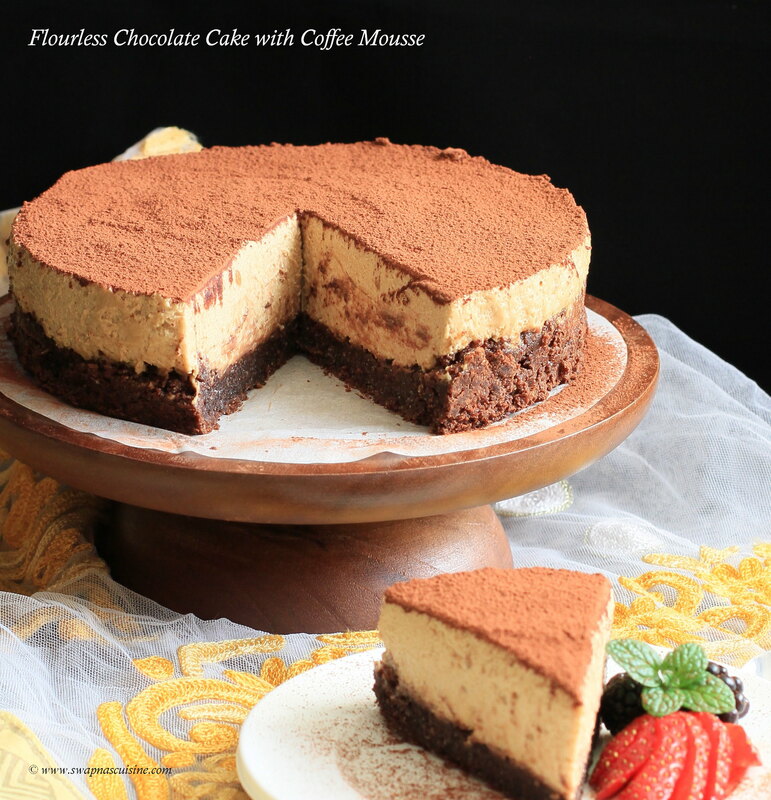 The rich and fudgy chocolate base is topped with aromatic, soft and silky coffee mousse. 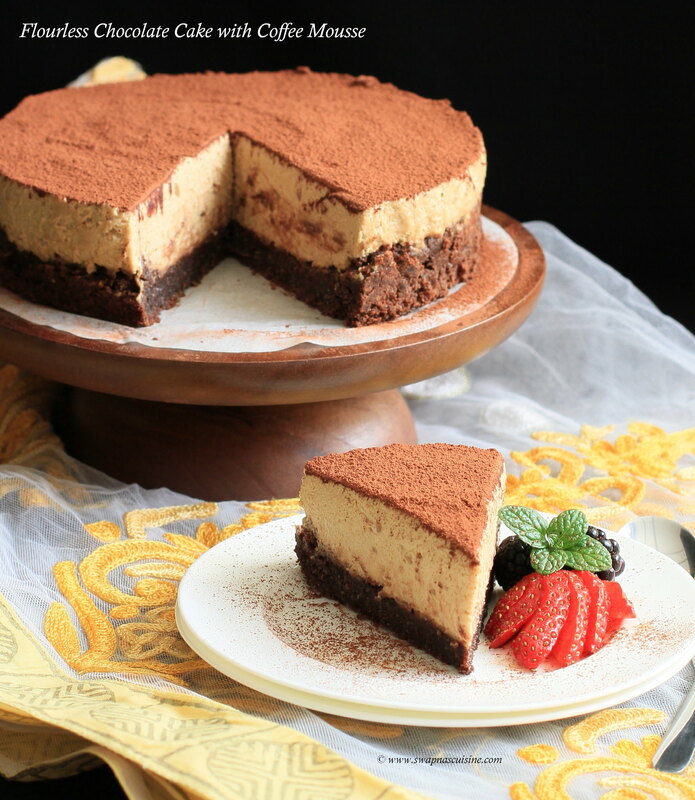 It is absolutely heavenly and decadent dessert to make for your loved one! Grease and line a 8-inch (20 cm) spring form pan (with a removable base) with parchment paper. Separate egg yolks from whites. Preheat oven to 180°C (350°F). Melt chocolate and butter over a bain-marie (double boil) until smooth. Let it cool slightly. Add yolks one at a time and stir well. Stir in cocoa powder and salt. Whip egg whites until foamy using a mixer. Gradually add sugar and whip until stiff peaks form. Gently fold the whipped whites into chocolate mixture. Pour batter into prepared pan and bake for 25 minutes. Let it cool completely in the pan over a cooling rack. Stir egg yolks with sugar until creamy and pale yellow coloured. Stir in corn starch. Gradually whisk in the warm milk until completely combined. Place the yolks mixture into a small saucepan and cook over low heat while stirring until boils and thickens. Remove from heat and stir in vanilla essence and instant coffee. Let it cool. Dissolve gelatine in 2 tbsp cold water and let it swell for about 5 to 10 minutes. Place over low heat just until the gelatine dissolves and then pour it over coffee mixture. Whip the cold whipping cream until stiff peaks form. Gradually incorporate into coffee mixture. 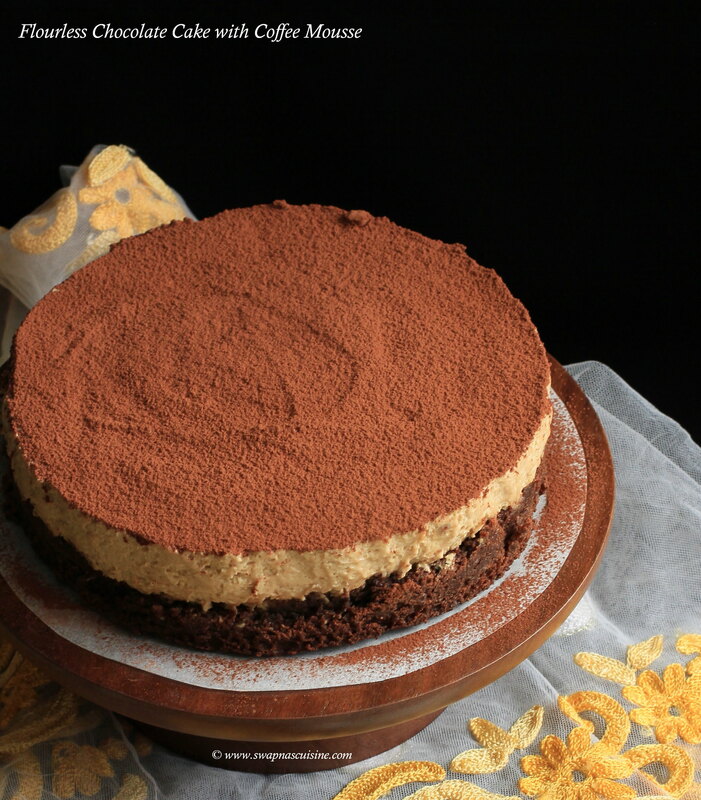 Spread the coffee mousse over the chocolate cake in the pan, using an offset spatula. Cover and refrigerate for about 4 hrs or overnight to set before serving. Run a warm knife around the edges of the cake to remove the sides of the pan. Dust the top of the cake with cocoa powder. Using a warm knife cut the cake into slices and serve. As usual a short break from blogging become a little too long, as is the case every time. I thought therefore that the first post of the year should be a wine recipe to compensate for the long-time neglected blog :) :) ... Grapefruit is a popular citrus fruit that is a terrific source of vitamins, fibre and other nutrients. It has a tart and tangy taste with an underlying sweetness. 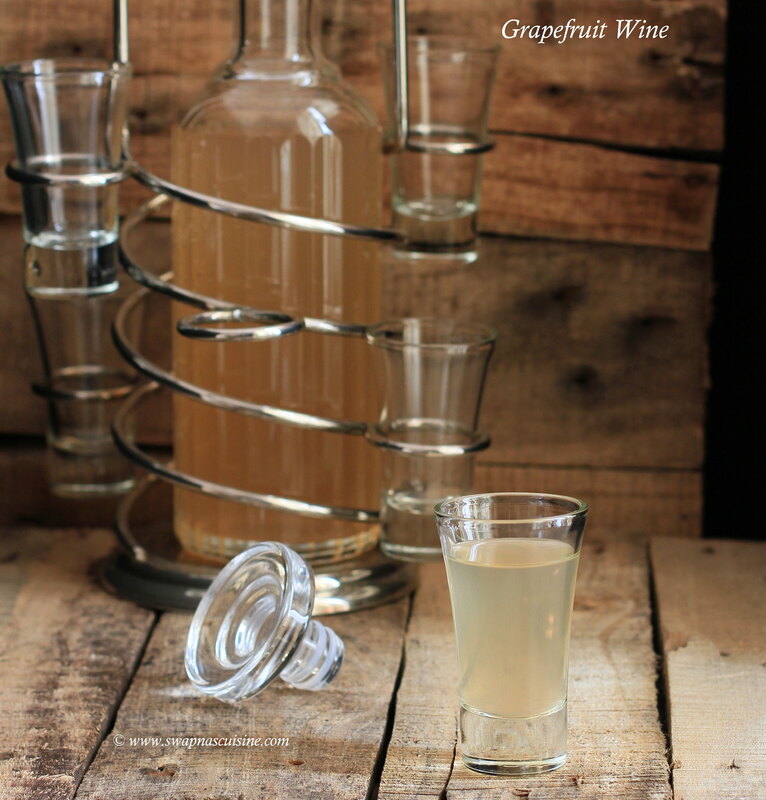 Grapefruit makes a delightful wine with a sweet and tart taste. Even though the wine will be ready in 21 days, if you allow it to age longer, you will get a mellow wine! Wash grapefruits and wipe it with a kitchen tissue or clean cloth. With a citrus peeler or vegetable peeler thinly peel the grapefruit zest from 3 grapefruits without the white part. Extract the juice from the all grapefruits and keep aside. Boil sugar, water and grapefruit zest in a big vessel. 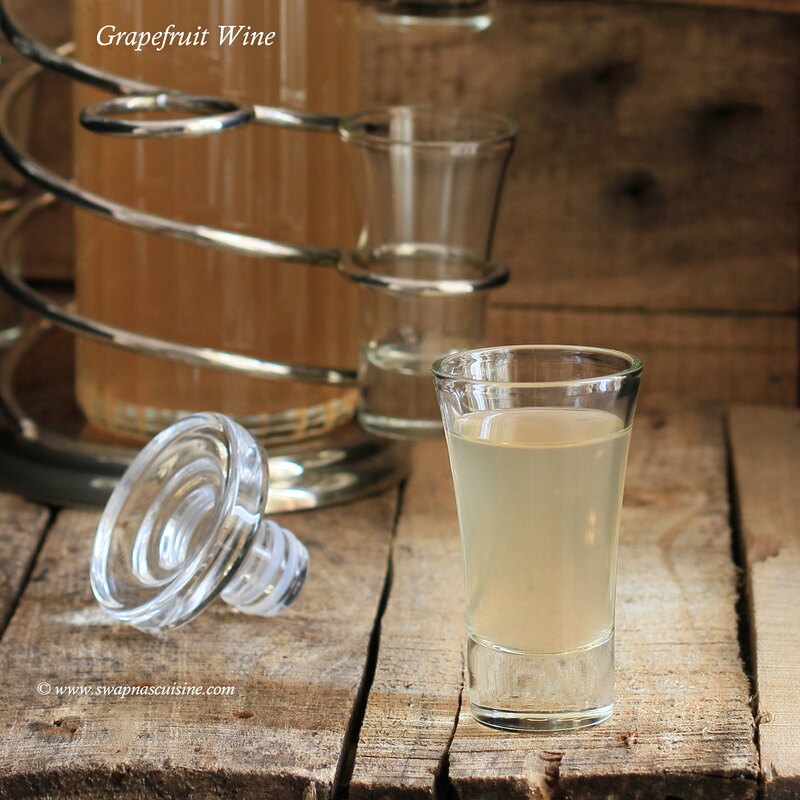 When the mixture begins to boil, add grapefruit juice and bring it to a nice boil and turn off the flame. When the mixture becomes lukewarm, add yeast and transfer the mixture to a sterilized glass bottle / bharani, cover it and leave for 14 days stirring daily. After 14 days, strain the mixture through a cheese/muslin cloth in to a clean dry bottle. Keep this again for 7 days untouched. After 7 days strain the wine again, pour it in to clean dry bottles and use.